Baby Doll has a similar concept as Room by Emma Donoghue but, in my mind, is handled much better and more psychological. 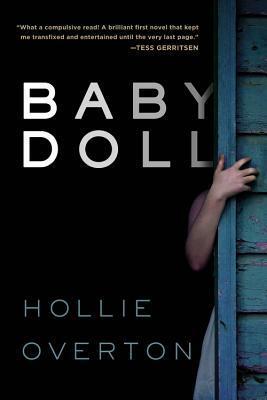 While Room is told from the perspective of five-year-old Jack, Baby Doll is told from the perspective of Lily, held captive since she was sixteen for eight years; her twin sister, Abby; her mother, Eve; and her captor, Rick. After Rick accidentally leaves the cellar door unlocked, Lily takes advantage of his mistake to escape with her daughter, young daughter Sky. The story that follows is that of Lily's homecoming and all the nitty gritty that follows: the hospital visits, the police, the reporters, the adjusting, the numerous revelations and twists. Hollie does an excellent job with a dark and tough subject matter. Each point of view is expertly written and completely engrossing. Lily is tough and strong, determined to not allow Rick to control her life now that she's free. Abby and Eve struggling to come to terms with what their sister and daughter endured over the last eight years. Rick, manipulative and twisted, attempting to understand why Lily would betray him, justifying his actions to himself, and convinced there are those that will sympathize with him. The decision to have these four narrators truly made the story interesting and engrossing. Yes, Lily's narrative is the most interesting, but by giving us these three additional narrators Hollie allows us to get a full and complete understanding of the events following Lily's escape. Additionally, the voice narrators (Jenna Lamia: Lily/Abby; MacLeod Andrews: Rick; and Ellen Archer: Eve) added an extra emphasis to the story. I don't typically encourage people to read the text verse listening to the Audiobook, but this is not an Audiobook (or book, really) you want to pass on. Overall, a heavy read but handled delicately and realistically.